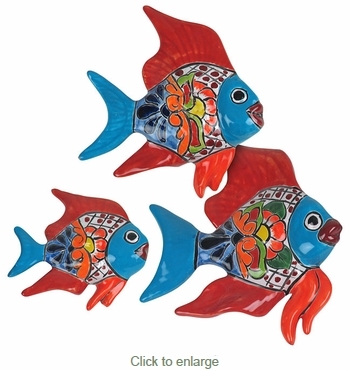 Hand made and hand painted by Talavera master potters, this bright and colorful trio of talavera fish is certain to bring a smile to your face. The perfect wall accent for your Territorial or Hacienda style home. Each Talavera fish is unique and may differ slightly from the image shown. Traditional Assortment: The design shown is of the Traditional Talavera style. Your items will be chosen from our current assortment of available colors and designs. The item you receive will likely be different than pictured here.